Toronto Dogs Directory: Allergies In Dogs - Yup, They Have Allergies Too! Allergies In Dogs - Yup, They Have Allergies Too! Almost 40% of dogs suffer from allergies every day. Allergies in dogs can be respiratory, just like in humans, but are known to affect the skin. An allergy is described as a hypersensitivity to a harmless substance, known as an allergen. An allergen causes the body’s immune system to overreact, causing irritation on the skin, watery eyes, ear infections and more. There are five known types of allergies found in dogs. Each allergy has both common and unique symptoms. Just like humans, the reaction to a specific allergen can range from mild to extreme, depending on the severity of the allergy. - Excessive biting, chewing and scratching, especially on the paws. Now we’ll take a look at some of the most common types of allergies in dogs, their causes and unique symptom of each. Inhalant allergies – These are the number one allergy found in dogs. Inhalant allergies are also known as Atopy, and the symptoms a dog gets are very similar to a human allergy. Some symptoms include watery eyes, excessive scratching and biting the skin, coughing or hacking, and sneezing. There are many things that can cause an inhalant allergy. Some can be seasonal, such as pollen, but some can be year round, such as dust mites or hair from other animals. 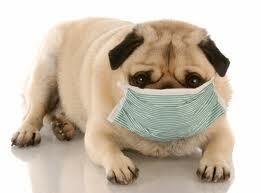 Contact allergies – Contact allergies are the least common types of allergies found in dogs. They can be a little tricky to treat because there are many different causes. Symptoms are hours of contact with the irritant. The most common symptoms of a contact allergy are bumps on the skin, and excessive itching or licking. Common areas affected are the paws, face, and belly. Other causes of a contact allergy include types of bedding, such as rubber or wool, or shampoos, lotion treatments, and certain types of metal, such as the nickel or chrome in a collar. Bacterial allergies – Bacterial allergies are caused by excess amounts of Staph bacteria on the skin. All dogs actually have a normal balance of Staphylococcus bacteria living on their skin. Extreme reactions to Staph are rare, but do affect a small percentage of the dog population. Dogs that have excessive skin rolls or “squished face” breeds are more susceptible to bacterial allergies. Some breeds include Pugs, Bulldogs, and Shih-Tzu’s. Dogs that are overweight can also develop bacterial allergies. Some symptoms of a bacterial allergy include hair loss, hot spots or welts on the skin, unpleasant odor, and thickening or hardening of the skin. A very common symptom of a bacterial allergy is a rash that resembles a ringworm infection. Food allergies -Dog food allergies count for about 20 percent of a dog’s excessive itching. These allergies can be very difficult to diagnose, mostly because people often confuse an allergy with food intolerance. A food allergy can develop in a dog as early as five-months-old, but dogs are not likely to be born with a food allergy. Sometimes a food allergy can develop as late as 12 years of age! Although it is not entirely known why dogs develop allergies to certain foods, it is very important to determine the difference between intolerance and an allergy. The most common symptoms of an allergy include itching around the face, ears, feet, and mouth. Other symptoms include recurring ear infections, increased bowel movements, and hair loss. The best way to determine if your dog has an allergy to food is to have a hypoallergenic test diet recommended by your veterinarian. Flea allergies -Flea allergies are also very common in dogs. A dog is not allergic to the actual flea itself, but rather to the flea’s saliva entering the skin from a bite. The reaction is similar to a mosquito bite on humans. A dog will actually cause more damage than the flea itself by itching. Even a single flea bite can cause a reaction in your dog if he has an allergy to the flea’s saliva. Common affected areas include the lower back, above the tail, the paws, and the belly. The most common symptom is excessive scratching and biting of the fur and skin. This may lead to sores and hot spots, so it is very important to treat fleas right away.